Outline: How sin, suffering and evil things came into the world. God made a way for us to come back to Him. Now I will tell you the sad story of how sin and evil things came into this world. The first man's name was Adam and the first woman's name was Eve. When God created man and woman in His own image they were good. They had never sinned, and they knew no evil. God made a beautiful and fruitful garden. He put the man and the woman in the garden to take care of it. A river flowed by the garden to give it water. God made the ground to bear a lot of fruit. God told Adam, "You are permitted to eat the fruit of any tree in the garden except one. You are not permitted to eat of the tree of the knowledge of good and evil that grows in the garden. If you eat the fruit of that tree you will die." This is the only thing that God forbade Adam to do. God loved Adam and Eve. They were close to Him. He gave them a good place to live. He gave them all the food they needed there in the garden. He only commanded them not to eat fruit from the tree of the knowledge of good and evil. However there was one who did not love Adam and Eve. This was Satan. Satan is evil and hates God. He hates everything God has created. Satan knew that God loved Adam and Eve very much. For that reason Satan hated Adam and Eve. Also in the garden there was a snake and it was more crafty than any of the other wild animals God had made. Satan entered the snake. This snake came to the woman Eve and spoke to her. He said to her, "Did God really say that you must not eat the fruit of every tree in the garden?" 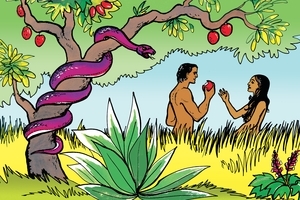 Eve answered the snake and said to it, "God said we may eat of any tree except the one in the middle of garden, the tree of the knowledge of good and evil. God said we must not eat from it nor touch it or we will die." The snake wanted to deceive the woman so he said, "You will not die! God knows that when you eat from that tree you will become like Him." The snake was lying to Eve but Eve listened to him. She decided to believe the snake instead of God. Eve looked at the fruit and ate it. Then she gave some of the fruit to her husband Adam and he ate it. After Adam and Eve ate the fruit their eyes were opened to understand good and evil. They tried to cover their bodies because they were naked and hide themselves from God. They knew they had disobeyed God and they were afraid. But no one can hide from God. No one can cover their sin so that God cannot see it. God knows everything about us. God found Adam and Eve and asked them, "Have you eaten from the tree I told you not to eat from?" Adam told God that Eve gave him the fruit and so he ate it. Eve told God that the snake deceived her and so she ate the fruit. God knew that it had really been Satan speaking through the snake. God cursed the snake. But, God loved Adam and Eve. He promised that one day He would send Someone to crush Satan completely. God told Eve that because she had disobeyed Him she would have great pain when she gave birth to children. God spoke to Adam and said that because he had disobeyed Him the ground would be cursed and not produce abundantly. There would be weeds and thistles and Adam would have to work very hard to get his food. Then God said to Adam, "You were made from the dust of the ground and so you will return to the ground." Then God drove Adam and Eve out of the garden. Sin had spoiled their fellowship with God. Now Adam and Eve could not be close to God. This is how sin and suffering and evil things came into the world. God had told Adam and Eve the truth. Satan had used the snake to tell them lies. Because Adam and Eve ate the fruit one day they would die. It is the same with us today, isn't it? We all die because we all sin and disobey God. We are all like Adam and Eve. Satan still tells us lies and we listen to him just like Eve did. Satan does not want you to listen and obey God's Word that I am telling you now. Satan hates all people and wants to deceive us. But I am telling you the truth about the God who created us. Keep listening and you will hear how God made a way for us to come back to Him and escape the deception of Satan. GRN has recorded a version of this script in 416 languages and dialects. See full list.